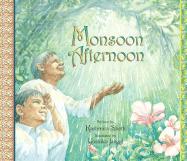 This picture book presents an affectionate portrait of everyday life in an Indian family. It tells the story of a young boy, restless at the outset of the monsoon season and miserable that no-one will play with him - until his grandfather volunteers. They brave the falling rain together, marvelling at the transformation it brings and - for the grandfather - memories of childhood and past monsoons. They sail paper boats, watch peacocks dancing, swing from a banyan tree, and pick the last of the mangoes, before returning home to be welcomed by steaming cups of tea - and scolded for making a mess.